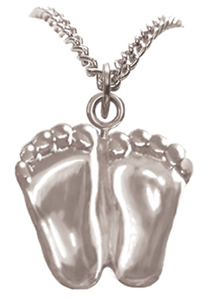 Description: Beautifully finished silver necklace of the International Pro-Life Symbol "Precious Feet". The Precious Feet are the exact size and shape of an unborn baby's feet at 10 weeks after conception. Since the infamous Roe vs Wade decision of 1973, the Precious Feet have been quietly doing their work changing hearts and saving lives. I give this necklace 5 stars because when I wear it, I always have people ask me about it. It starts a conversation about my pro-life views. I had been wanting to order the Precious Feet necklace for sometime, and am so glad I finally did. The tiny feet are a sweet reminder of the pro-life movement. It's my favorite necklace. I have used these to present the Sanctity of Life to my fellow workers who were expecting their 1st child. The response was really great. I wear my necklace to work and school as a reminder of my dedication to the unborn and as a memorial to those precious children who have been killed in the very cities where I work and go to school. I just want people to know! What a great necklace and a great way to start conversations. I work with a non-profit organization called Lanee's Legacy. We make bereavement boxes for families who have lost an infant at birth or shortly after. In these boxes we put many items including a feet necklace. The mothers really enjoy having something to wear or remind them of their precious baby. I received one myself and loved wearing it especially when I was missing my baby. We have gotten so many wonderful reports about these necklaces from the nurses that work at the hospital that we donate the boxes regarding the necklaces. I highly recommend these necklaces for all mothers. A visitor to our fair booth requested one of these necklaces. The interest in pro-life continues. A sweet way to share the truth of little babies. No "tissue" here, these are real babies with real toes. Realistic size, I've compared them with "real" miscarried babies in my work as a midwife and they are quite accurate. I gave these necklaces to my volunteers as a gift with the feet ear rings. They loved them, and wear them frequently. I bought these for my volunteers as a gift. They loved them. They are great to go with the ear rings and pens. I love my Precious Feet necklace. I get more comments than when I wear the pins as they are a little more noticeable. I have purchased them for gifts for people. I love these necklaces. I ordered several of them to sell at a pro family event and they sold out quickly! I had purchased some of these necklaces to go with earrings I had purchased and they are a HUGE seller! I didn't believe how much everyone wanted these but didn't know where to get them. I have one I wear on a bracelet. I am thrilled to be able to find these precious feet on a necklace. I work at a pregnancy resource center, so it is a good way to start a pro-life conversation.